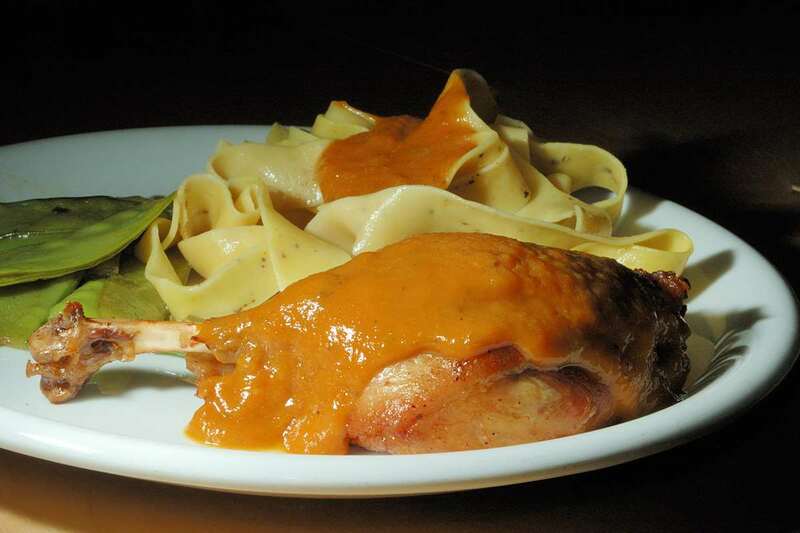 In this duck leg recipe, the sauce is made with dried apricot, sage and Madeira. It is flavorful and a bit tangy. In my experience it works very well to cook duck legs in the pressure cooker and it speeds up preparation by quite a bit. Set pressure cooker over medium-high heat. Sprinkle duck legs with freshly ground pepper. Brown duck legs from all sides for ca. 10 minutes, skin side first. Remove legs and duck fat. Return 1 tbsp of duck fat to the pot. Add onions and cook until very lightly browned. Add sage, carrot, garlic, sugar salt and chopped dried apricots. Cook for a few minutes. Cook with high pressure for 45 minutes. Release pressure. Remove duck legs, set aside. Add remaining Madeira to the pot. Blend well with a stick blender, add some water if the consistency is too thick. Add chopped parsley. Serve hot. For crunchier skin, broil the legs for a few minutes (broiler on low). This recipe is a variation of my Duck Legs in Orange Sauce recipe.